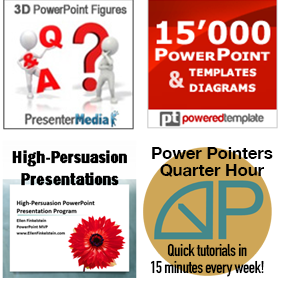 Most people think of PowerPoint as a visual aid for a live presentation. But there are so many other ways that people use PowerPoint. Can you think of more uses? Leave a comment! I’m pleased to announce that this is my 500th post! Have you found useful content on this blog? What would you like to see that you haven’t found? Thanks for all you do! Happy 500th! Weddings. Photo album of couple. I just started experimenting with creating squeeze pages and one page sales pages for websites using Powerpoint. I saw that most of the WSOs on the Warrior Forum were just graphics pages with no text so I used that as a model and found it works really well if you use Powerpoint. Much easier than buying these expensive programs or WP plugins to make squeeze or sales pages – all that I purchased were either expensive, difficult to use or complicated. I do a screen capture of my header and then just create the graphics for the rest of the page adding images and text as images. I also made a optin form with Powerpoint. You gotta love Powerpoint, my copy of Photoshop has been gathering dust for months. The more I use Powerpoint the more I love it. We have created tests using PowerPoint and still use tests with screen prints using macros to show the correct answer and give a score at the end. I use it as a white space for testing color pallets and font styles used in a cohesive solution. It’s a design tool. I have no problem using PPt for almost any graphic problem I might run into, from final product to sketch. I love being able to just crack it open and format it for any page size I might need and go from there. I know, it’s not Photoshop, Illustrator or InDesign but none the less it’s like having an imperfect tool kit, so deep, you know there’s tools you’ll never need until you do. And they keep on getting better!! Charles, can you give me a link? I’d love to see an example of a squeeze page and sales page done with PowerPoint. And how do you code the opt-in form using the image you create in PowerPoint? I’m glad that you’re getting great value! Yes, I forgot to mention tests–thanks for bringing it up. It’s a great use for PowerPoint! I just thought of another use — greeting cards. I’ve used PowerPoint to create birthday and New Year’s cards — often animated. Thanks, Tom! I agree that you can use PowerPoint for almost any graphic problem. When I go into Photoshop, I almost always get frustrated. Wilma, that’s a great point! I’ve used PowerPoint to make photo albums. The photo album feature is the fastest way to get multiple images into PowerPoint. I create PowerPoint photo albums when I go on major trips to far away places. Jesus, do you use PowerPoint specifically with Google hangouts? Ellen, congratulations on reaching 500 posts! They have been awesome to read and I appreciate your time in sharing. You’ve impacted my presentation style tremendously and the feedback from those sessions has been really positive. PowerPoint is my “go-to” program for students with severe physical and speech disabilities. I scan picture books in for them to access independently via switches and utilize some of the more advanced animation features to give access to other academic tasks. I use it to enlarge and sharpen text for kids with vision impairments, to read narration for non-readers, to teach targeting skills to students learning to control their muscles (requires a touch screen), to give kids with severe motor impairments a way to present “oral reports…,” and so much more. It’s a great motivator for beginning writers, too…we make photo stories out of class events or field trips, the kids write (and narrate) the stories, and then the story loops in kiosk mode during Open House. It can even work as communication software for non-verbal kids! It is amazingly adaptable and a socially respected tool for leveling the playing field for kids at a physical disadvantage. Another benefit to PPT over other special needs software is its availability across schools and homes and devices, so students can enjoy their activities wherever they are. I’m still wishing for a version of PPT that would run on Kindle Fire with animations (NOT a video loop as is the only option currently available) to create portable augmentative communication. Someday, right? Ellen, congratulations on reaching 500 posts! 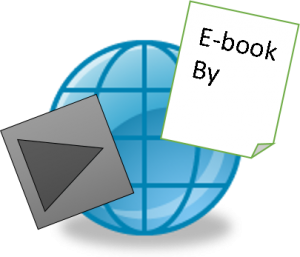 I am writing my book “Presentaciones Revolucionarias” using PowerPoint as a book editor. I’ve enjoyed all the ideas so far. Here are some other uses that I use PowerPoint for. Self running photo albums for weddings, birthdays, anniversaries, funerals. Some of funeral homes charge $250 for this service. Along the same vein, I make self-running ‘flash cards’ of students pictures with them holding their names (like a nice mug shot) to quickly learn their names for a new semester or for working with a new youth group. I can quickly refresh my memory just before I see them again or print them out as handouts to ‘cheat’ in class. Making personalized greeting ‘cards’ for all kinds of events. For young children, I put in something for them to find on each slide (like a bunny that pops up or crawls slowly across the bottom, or hides in a picture). I agree with all those who said to use it for graphic designing. Save the slides as pngs for web pages and/or social media. I design graphics for assignments to hit the highlights and often use the SmartArt tools for that. I remove backgrounds and layer fun photos for friends birthdays to post on their FaceBook page. I have so enjoyed the ‘Relative Presentations’ we learned about from another Outstanding Presenations session from Robert Lane for in-person presentations. And the beat (I mean the list) goes on and on……..
We use PPT in conjunction with Easy Worship (presentation software) at our church for pre-service announcements. We use animations on most slides. The transitions are timed and the presentation is looped. The result is that less time is spent on announcements from the pulpit. Congratulations on reaching such an impressive milestone – you’re doing great work and I wish you much continuing success! One of the additional things I’ve used PowerPoint for is creating memorial programs for funeral services. There are plenty of other programs for this, but PowerPoint is more ubiquitous and easier to edit if needed. Thanks as always for all you have done for the PowerPoint community! Actually, many things can be done right in Powerpoint that are done in Illustrator and InDesign. Many, not all, of course. And if used in conjunction with both Illustrator, Photoshop, and other vector creating software, Powerpoint rocks. I’d like to point out that the value of advice and guidance from PowerPoint experts will depend heavily on assumptions about how PowerPoint is actually being used. For example, it makes a lot of difference whether there is an actual presenter involved. Another example of PowerPoint usage is collaboration – collecting ideas, brainstorming, etc. My own humble ideas on the uses of PowerPoint can be found at http://wp.me/pFbc7-4D. I agree that the advice given should depend on the use. Of course, those of us giving advice online usually don’t know how our readers are using PowerPoint. I especially like the idea of using PowerPoint as a collaborative tool. Using the online version could be especially helpful for this — instead of passing around files via email. Peter, I’ve also used PowerPoint to create a mock-up of a website to give to a web designer. I used to use Power Point as the framework for exams and for students creating a single Power Point that is “really” them. Congratulations Ellen! You offer so much value in your blog posts and courses! Beat wishes for the 1000th blog celebration.